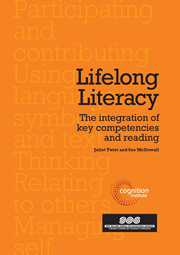 This report presents the findings of a research project which explored how the key competencies described in The New Zealand Curriculum (Ministry of Education, 2007) might be integrated with the teaching of reading in the middle years of primary school (Years 3–6). The project involved researchers supporting teachers to conceptualise key competencies more deeply and design and implement reading programmes which integrate the competencies. The project was funded by the Cognition Institute.